Empress Wu Hosta (40″T x 70″W) and Gentle Giant Hosta (46″ T x 70″W) have been two of our biggest sellers of the giant hosta varieties that we grow over the last two growing seasons. Hosta gardeners are clearly obsessed with size and I can understand this from my own gardening experience. A four foot tall Gentle Giant sitting out in, or standing out in, a hosta bed is a tantalizing thought. Sum and Substance Hosta (32″T x 72″W) and Blue Angel Hosta (32″T x 70″W) were the big two in popularity among the hosta giants for a long time. And they still are popular. No hosta garden should be without them. 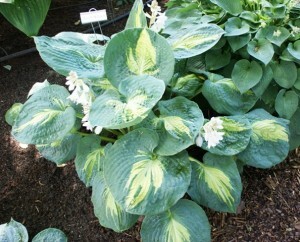 The Hosta Victory (35″T x 70″W) and Dream Weaver Hosta (30″T x 72″W) are also very popular and have the added feature of being variegated. The giant hosta Dream Weaver is a personal favorite due to the contrast of the blue-green border and the creamy-white center. 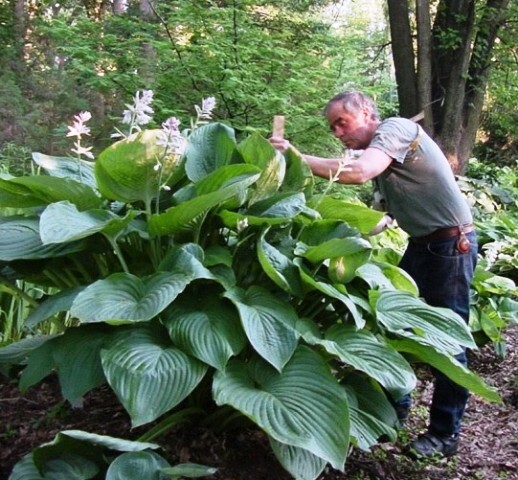 How large a hosta can reach in size is not only determined by the cultivar you choose. Location has a great deal to do with its ultimate size. Giant hosta plants need unlimited water and a deep rich soil, more so than the smaller cultivars of hosta. You need to select a site away from competing tree roots to get a giant hosta plant to achieve its maximum potential.